I am so busy with work generated from my Artist-in-Residence at the Colne Blues Festival along with other works prompted by live gigs that my landscape work has taken a back seat! 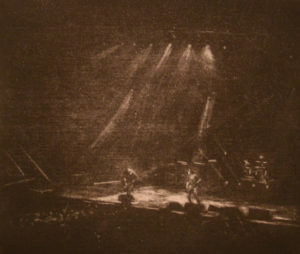 I have recently completed my sixth oil painting from The Great British Rhythm and Blues Festival. I have another six from the festival at various stages of development and then I have works inspired by Steve Hill, Wishbone Ash, Status Quo, Kenny Wayne Shepherd and Laurence Jones barely started! There may even be leaves on the trees by the time I mange to get back out into the landscape! 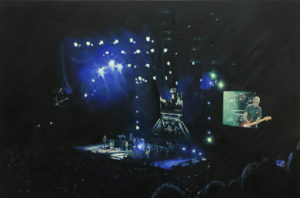 A sale was agreed for “The Who”, oil on canvas, in December and an etching inspired by Alter Bridge also found a new home in December. Limited edition Giclee prints of The Who are available and there are still a few limited edition prints of “Live On Stage” available. …many sketchbook drawings and recent trace mono-prints are not listed so do get in touch if there is something you cannot find.